Babies are susceptible to a number of skin conditions that may look very scary to parents. In most cases, red spots on the face, neck and ears do not indicate a serious medical condition. To determine the cause of the spots, note any changes you've recently made in your baby's diet and environment. Consult your pediatrician for any rash that gets worse after several days or is associated with a fever. A number of minor conditions may cause red spots around the face. Severe dry skin, mosquito bites and sensitivity to facial care products may all cause spots. Eczema, a chronic skin condition that makes the skin dry and patchy, often is concentrated around the face and head. It is common in babies, who typically outgrow it in several years. Some babies develop cradle cap, a harmless skin condition concentrated on the top of the head that may also be on the ears and around the face. Because none of these conditions is life-threatening or results in serious symptoms, it's fine to attempt home treatment for a day or two if your child has no other symptoms. Chicken pox, although rare in infants, is an illness that affects almost all children at some point, according to pediatrician William Sears. Small, itchy bumps frequently start on one part of the body and then spread. 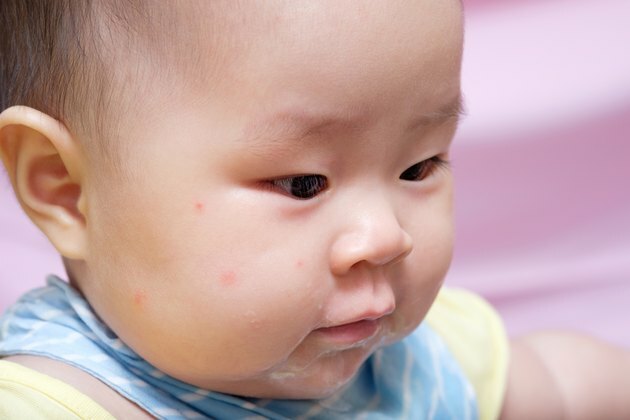 If you think your 2-month-old may have chicken pox, contact your pediatrician immediately. Some babies become very sick from chicken pox. Allergic reactions may also cause spots. If your baby has a fever, difficulty breathing, vomiting, diarrhea or has stopped eating, he may have an allergic reaction and needs emergency medical care. If your child is itchy or in pain, breastfeed frequently to help soothe and comfort him. Breastfeeding also boosts immunity. An oatmeal bath may help to minimize itchy, dry patches. If you've recently switched formula brands, use the old formula again to minimize allergies. The treatment your doctor recommends depends on the symptoms and diagnosis. Chicken pox normally must run its course, but your doctor may prescribe medications to alleviate symptoms. A severe allergic reaction may require a shot of epinephrine and intensive care. Many skin conditions are treated with antihistamines, lotion and dietary changes.